Each of my past marathons has a theme that I remember well. In Chicago, it was 'I'm way too hot.' For Seattle RnR, 'my side hurts with every step.' And CIM? 'This is awesome! I'm having fun! Oh look, puddles!' It's the strangest thing because I know the weather was tough, it was raining hard, and it was very windy - but I don't really recall any of those things when I look back on running the race. I'm thrilled with my time of 4:43:59, a 27 minute PR over my last marathon, and I can honestly say I felt good the whole time. Kevin also had a PR with his 4:02:00 finish. That said, the start line was another story. The weather forecast predicted rain and wind, and that we had. Kevin and I hopped on the bus from our hotel around 5 am and rode to the start line in Folsom. It was raining hard and felt so cold when we arrived and hopped out to use the porta potties. Luckily, the organizers let us stay on the bus until 15 minutes before the start so we weren't getting drenched. I made a second trip to the porta potty in even worse rain and wind, and when I got back to the bus I swore it was hailing. It felt like little pellets. By this point I was already very, very glad I had decided to wear my jacket. I can't tell you how many times I wanted to bail on the whole thing that morning. At the start area I said good luck to Kevin and headed back to join the 4:40 pace group; I figured it would be more fun to handle the weather with a group then to go it alone. We introduced ourselves and started talking from the beginning of the race, and this is when things become a blur. I remember little things like dodging garbage bags on the ground and water in my eyes. I know a big palm tree branch fell on the road not too far from me and people were yelling. I remember splashing through lots of puddles, some way over my shoes. But most of all? I remember talking to the other 4:40 group runners, people cheering for us even in the rain, and carrying the pace sign for a while when our pacer needed the restroom. I wasn't cold (thanks Oiselle Clearly jacket!) and I wasn't miserable at all. I stayed with the pace group until mile 20.5, where I said good bye and broke off for a bathroom break. I'm a little sad I didn't get to finish with the group, but your body needs what your body needs. They had a big line of porta potties and no line, so it was the perfect time to stop fighting it. The last few miles on my own were less exciting; my glutes were getting super tired and I slowed down a little bit, but I focused on staying ahead of the splits on my 4:45 pace tattoo. Without my 3-4 minute bathroom break, I think I could have stuck it out with the 4:40 pace group. For the last two miles I just remember thinking 'I'm going to do this! I'm going to hit my goal!' and had a big smile on my face. There were more and more people spectating as we came into downtown and they gave me the last little push I needed. The next thing I knew, I'd turned the corner and the finish was right there. Victory! I found Kevin right away waiting at the finish and then headed off to get food. They had pancakes, which in theory I thought would be great, but I couldn't stomach anything solid as usual after a long run. I went for water and chocolate milk instead. Sadly I didn't see any other friends at the finish or after as I hoped, but it was a good decision to go straight back to the hotel for a warm shower and rest. I'm thrilled that I finally felt good for a marathon, that my body didn't and overheat or side cramp severely, and that the weather wasn't hot. Call me crazy but I would take this weather again anytime over the heat we had in Chicago. My side cramp did rear it's ugly head a little later in the race, but I was able to keep it mild by focusing on breathing and telling myself not to panic. I swear it's worse when I get anxious. When it first started a lady in the 4:40 group gave me a mustard packet to eat, saying she knew experienced runners who always use it for extra electrolytes. It actually worked and the cramp completely subsided for a while; whether in my head or the mustard, I was a happy girl. Now for more on the race itself. The Expo. The expo was what I'd consider mid-size and held at the Sacramento Convention Center; I enjoyed the Christmas decorations at the expo. We didn't spend much time walking around after picking up our packets because the booths and offerings were pretty standard. I stopped by the SF Marathon booth to say hi to Ambassador Laura, and I met up with a few Oiselle team ladies. It's so much fun to meet everyone in person. Oiselle team: Sarah, Arielle, Megan, me, Jen, Stacy, Allison. Kevin's ready to run. Also, it was his birthday. The Swag. 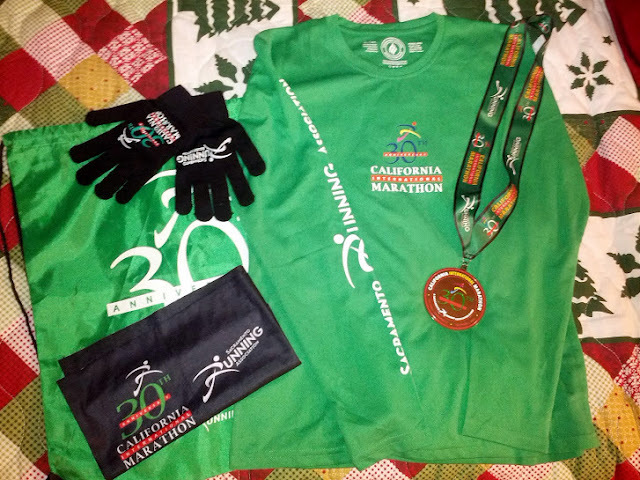 This was the 30th Anniversary of CIM so they gave runners extra race swag with the 30th logo: tech shirt, nylon spike bag, gloves, and headbands/neck gaiters. The shirts fit very well plus you could choose long or short sleeve at registration, a nice touch. Last but not least, the medals are huge! The Course. The CIM course is described as fast so it's easy to assume this course is flat. In reality, it has rolling hills basically the whole way. I prefer this kind of course because I like the change in muscle use, but it's a good thing to note if you decide to run CIM. The nice part is none of the hills are big or steep; I never had the 'I can't run up anymore' feeling during this race like I have with other courses. The uphill rolls end around mile 22 or 23, and after that it feels flat and even slightly downhill. The Support. These volunteers and spectators deserve a huge round of applause for being out there in the rainy weather! I was surprised how many people were actually out watching the race and cheering, and it was fantastic. Volunteer support on the course was great, fluid stops were stocked with blue Powerade and water. They handed out Gu a couple of times later in the race, both caffeinated and non-caffeinated versions. Fluid stations seemed really close to one another especially near the end, which felt unusual but also welcome. The start and the course had plenty of porta potties, and I was excited for the long line of them just after mile 20 so I could run in without waiting in line. The finish line had tons of food too, an impressive amount of food really. I saw pancakes, chocolate milk, Clif bars, fruit, cookies, tomato soup, water, and I'm sure I missed something in that list. The bus ride to the start was super easy and they picked up at a number of hotels including ours. We had bus service back to our hotel (Hilton Arden West) from the finish line area as well. Hint: staying a little farther out saved a ton of money on hotel cost and the bus service made it convenient. Here's to wrapping up my 2012 race goals with a marathon success - cheers! Thanks Becka! Congrats on finishing in the crazy weather too! Congrats on your new PR!!! Awesome!! I totally felt the same way about the volunteer and water stations (so many!!!). I can't believe you were dodging tree branches out there, scary!! Congrats on the pr! I realized this was the first marathon I've run and not seen you, but we did see the 4:40 pacer... The rain bullets made things tough ;). Bummed I didn't get to see you guys too - I bet I was around the pacer but I didn't see you guys either. Great job on the crazy weather finish! Congrats!!! I'm so glad you had such a wonderful race!!! Congrats to you and Kevin. It was quite a memorable race! Great job on your race! Sounds like everything went really well despite the weather. Yay! You hit on so many points that I've been thinking about. I totally thought the rain felt like sharp little hail pellets. It kept knocking my contacts down, I'd blink, then they'd go back where they belong. I was sure I'd lose a contact but I didn't! The support WAS amazing! I thought about the volunteers and people out there cheering for us so much during the race! I kept thinking, wow, we have it easy compared to what they are doing! So thankful! This was such a positive experience for me as well. I'm so happy we were able to meet in person!! Oh no - knocking contacts down is terrible! I'm super glad we got to meet too, congrats on your great race! You did a GREAT job hitting your goal! And pulling in a hefty PR while having a blast in that storm is the most awesome thing yet :) Congrats!!!! A huge congratulations! What a fantastic job you did under with difficult weather to deal with. How great to meet fellow birdies! Really nice job on this race report. Awesome job and lookin' good in the process! Thanks Rene - great job to you too! Congrats on your PR!!! You did fantastic, and in such super awful conditions!! I've been dealing with the side cramps for a while too. I think I am going to try out the mustard packet idea, can't make it any worse! Congratulations on your PR! Great race report. I'm glad you had such a great race!!! I was thinking about you with the weather reports that morning. I agree, I'd rather run in rain than heat too. Aw thanks! I'm glad I'm not the only one who prefers rain to heat. :) Might be the mid-western blood. Me too! I'm also midwestern born (Yooper). Yes crazy weather - thanks! Congrats Paulette! I can't keep up with all of your PR's! You killed it this year! So exciting and very happy for you! Love the CIM gloves. I don't know why but I love souvenir gloves. Aw thanks. :) I had a good year for sure, hopefully next year will be even faster...I'm trying! Congrats!! You and Kevin look like the happiest runners :) And I love the pace tattoos! So cool. I've never heard of those before. Aw, thanks. We were so so happy! Congrats! What a great way to finish a year full o'marathons! And I'm with you - I'll take rain & wind over heat any day of the week. Congrats on your PR! Way to find the bright side of what could have been an otherwise miserable marathon! Congrats on your PR! And a big one at that. Very happy you had a good day out there. Sorry I missed the Oiselle meet up. I didn't get in to Sacramento until around 3. You all look fantastic! Good job! As a huge fan of swag, that looks like a great haul! I love a course with hills for the same reason. I think a good run needs the use of many different parts of the legs and core. If this isn't the case, it is really up to you to change form and keep from overusing parts. Way to go! How does the pace tattoo help? I've always thought those were a little strange...can't you just calculate the math? But the farthest I've ever run is a half-marathon, so I just realized that maybe it's most helpful for when you're so tired that your brain stops working during a marathon??? I wasn't sure how helpful it'd be either but I figured why not try it? I like it because I don't have to do the math when I just want to glance at my watch. With the pace band I know I'm ok if my watch time is ahead of the suggested time, and it was so nice. Less thinking when tired! Congratulations on the PR!!! I can't even imagine a PR in that weather. Way to Kill it! Wow great time & congratulations. Congratulations on the PR! So exciting to feel good through the entire 26.2! Thanks - it was amazing, my big goal was just to feel good! I agree! The start was the WORST but the rest of the race turned out to be surprisingly awesome! Congrats on the PR even in craptastic conditions! Thanks! I'm glad you had a good one too!